“`Angels Flight, the beloved little railroad in Los Angeles, had a cameo in La La Land, and now, it’s almost ready to re-open. It originally debuted on New Year’s Eve in 1901, hauling residents from Bunker Hill’s stately Victorian mansions to one of downtown’s best shopping districts. Rides cost a penny. “`The narrow-gauge railroad that for more than a century hauled folks 298 feet up-and-down the city’s steep Bunker Hill was shut down in 2013 after a series of mishaps, including a crash that killed a rider. “`At a news conference, Mayor Eric Garcetti said issues are being resolved, and the railroad’s antique wooden cars, named Sinai and Olivet, should be back in service by Labor Day. They’ll be operated by a public-private partnership between the nonprofit Angels Flight Foundation and the private company, ACS Infrastructure Development. Meanwhile, work still needs to be done before the cars can move again, under an agreement reached with the state’s Public Utilities Commission. “`The railroad’s resurrection has been planned for months. But, it has gotten an unexpected boost when movie-goers saw Emma Stone and Ryan Gosling happily riding in one of its cars in La La Land. People took to social media to ask why they couldn’t ride. 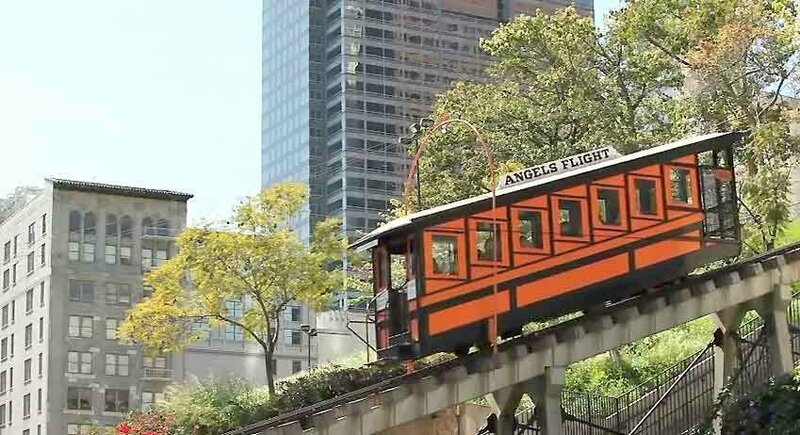 In spite of recent woes, Angels Flight, listed in the National Register of Historic Places, holds a special place in the hearts of local residents of all ages, thrilled to share countless childhood stories. It was prominent in the movies, Criss Cross, The Glenn Miller Story, The Indestructible Man, and a television episode of Perry Mason. “`It operated until 1969, shut down as the neighborhood underwent redevelopment, after the area fell on hard times. It reopened in 1996, just as the area went through a renaissance. For the next few years, the railway carried tourists and office workers from skyscrapers, museums and hotels that sprung up on Bunker Hill to the Grand Central Market, below. It was shut down after a catastrophic system failure that sent one car crashing into the other in 2001. Reopened in 2010, it was closed three years later after a derailment stranded riders. “`It looks like we are once again close for our Angel to take Flight. This entry was posted on Wednesday, March 1st, 2017 at 7:21 pm	and is filed under Blog by Manny Pacheco. You can follow any comments to this post through the RSS 2.0 feed. Responses are currently closed, but you can trackback from your own site.